Fourth favorite Graceful Leap claimed this year’s JBC Sprint, registering his 12th win, all on dirt over distances between 1,200 and 1,400 meters—notable victories include the 2016 Summer Champion, 2017 Korea Sprint, 2018 Hyogo Gold Trophy and Tokyo Sprint. 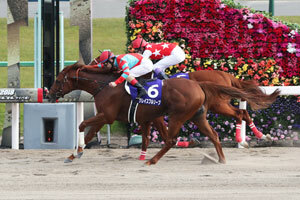 It was the first JBC Sprint title for both trainer Shinsuke Hashiguchi and jockey Christophe Lemaire. Graceful Leap stayed close to the pace in fourth, increased his speed as two of the foes in front were quick to tire before the final turn. The eight-year-old chestnut closed in on the leader, dueled and crossed the wire a neck in front for the title. “We were able to secure a perfect spot behind Take (on Matera Sky) and from there the horse gave a great effort,” commented Christophe Lemaire. Race favorite Matera Sky immediately rushed for the lead from a smooth break and made the pace. The son of Speightstown led along the rails and sustained his bid up to the final strides where he was pinned down by the eventual winner and missed by a neck in second. Fifth choice Kitasan Mikazuki, who had beaten both the winner and the race favorite in his previous start, was rated near the rails in mid-field and exerted an impressive turn of speed to reach contention but unable to reach the top two who had already gained a comfortable lead from the rest of the field. 14th: (9) Seiun Kosei—mid-division, edged forward traveling 3-wide, even paced. T. Umeda Hirosaki Toshihiro HD Co., Ltd.
T. Kayo Win Co., Ltd.
S. Temma LS. M Co., Ltd.
S. Kokubo Blue Equus Co., Ltd. Owner: Shinji Maeda Breeder: North Hills Co,. Ltd. 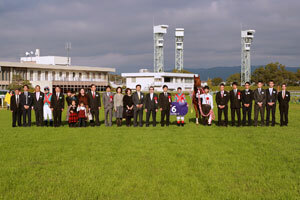 The Japan Breeding farms’ Cup (JBC) was established in 2001, following the idea of the two-day racing festival held by the Breeders’ Cup in the U.S., by the JBC Committee, mainly composed of members of horse breeding organizations and the National Association of Racing (NAR), to promote dirt racing in Japan. While nearly 90% of graded races at JRA are raced on turf, most of the graded races on dirt are held by NAR since JRA and NAR set up a joint racing program in 1995 and the JBC serves as an important dirt championship event for both JRA and NAR dirt horses. Seven NAR tracks have served as host sites of the JBC Day, initially consisting of two races, the JBC Classic and the JBC Sprint, with the JBC Ladies’ Classic added in the program in 2011. In order to further disseminate the attractiveness of JBC and dirt races to a broader group of fans, the event was hosted by JRA for the first time this year and held at Kyoto Racecourse. The Tokyo Hai (dirt, 1,200m; Oct.10), which is the JBC Sprint trial, was won by Kitasan Mikazuki. Nero, winner of two consecutive Keihan Hai (G3, 1,200m) titles came in second with Graceful Leap, who has four major titles on dirt between 1,200m and 1,400m, in third. Last year’s JBC Sprint champion Nishiken Mononofu came off a fourth-place finish in the Hokkaido Sprint Cup (dirt, 1,200m; Jun.7). Contenders coming off the Sprinters Stakes (G1, 1,200m; Sep.30) were 2015 Oka Sho (Japanese 1000 Guineas, G1, 1,600m) winner Let’s Go Donki, this year’s Keeneland Cup (G3, 1,200m) victor Nac Venus and 2017 Takamatsunomiya Kinen (G1, 1,200m) champion Seiun Kosei who had finished fifth, seventh and 12th, respectively. The field also included this year’s Procyon Stakes (G3, dirt, 1,400m) winner Matera Sky and 2016 February Stakes (G1, dirt, 1,600m) champion Moanin who came off a victory in the Korea Sprint (dirt, 1,200m; Sep.9).